Darwin gilt wegen seiner wesentlichen Beiträge zur Evolutionstheorie als einer der bedeutendsten Naturwissenschaftler überhaupt. Heute stellt die von ihm begründete und seitdem ständig weiterentwickelte Evolutionstheorie für die Biologie das grundlegende Paradigma dar: Durch sie werden alle biologischen Teildisziplinen, wie Zoologie, Botanik, Verhaltensforschung, Embryologie und Genetik, „unter einem einheitlichen Dach“ versammelt. Kein anderer Wissenschaftler des 19. Jahrhunderts hat unser modernes Weltbild stärker beeinflußt als er. Naturforscher (1809–1882). LS signed “Ch. Darwin”. Down House (Kent). 5 SS. auf 3 Bll. Gr.-8vo. 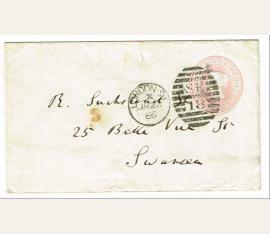 Letter to Rudolf Suchsland, the son of German publisher Friedrich Emil Suchsland. In full: “I have not heard from Mr. Schweizerbart so cannot give a definitive answer to your father; but the more I think on the subject the more I feel that I am bound not in any way to support another edition. For this reason alone I am sorry to say that I cannot offer to send clean sheets of the new English edition of The Origin as they are printed off; and the corrections & additions are so numerous that they c'd be send in no other way. With respect to your enquiry about my other works; in your list you give the same book twice over with different titles. My Journal of Researches &c was translated in 1844 into German by Dr. Diefenbach (Viewig & Sons Braunschweig) but the translation was made from the first English edition. The 2nd Ed. was considerably condensed & improved & was published under the above title of 'Journal of Researches' & has had so very large a sale in English (viz. 10,000 copies) that it might possibly be worth re-translating into German. The Zoology of the Voyage of the Beagle is a very large book with most expensive illustrations. My work on Cirripedia consists of 2 thick Vols with numerous illustrations. It is obviously out of the question to think of translating either of these works. My geological works consist of 3 thin Vols, now I believe always sold by Smith & Elder bound together in one thick Vol. These consist o 'The Structure & distribution of Coral Reefs.' This is a work of some interest, & if my name had formerly been known in Germany and have been worth translation. The other two parts consist of 'Geological observe. on Volcanic Island' & 'Geolog. Observ. on South America.' My work on the contrivances by which orchids are fertilized has been translated into German—at towards the close of last year I published in the Journal of the Linnean Soc. & separately a little book on the 'Movements & habits of Climbing Plants,' of which I send you a copy. I cannot suppose that this w'd be worth translation, although formerly 2 little books appeared in Germany on this subject, & I may add that this treatise has been highly spoken of by Botanists. If it were translated, which I repeat I do not think w'd answer, it might be worth while to add three papers by me published in the Linnean Journal on a very curious subject namely Dimorphism & Trimorphism in plans & which has been a good deal discussed in German scientific periodicals. I will write again as soon as I hear from Mr. Schweizerbart but I have hardly any doubt that he will agree to my proposals.” In very good condition, with intersecting folds (one vertical fold passing through a single letter of the signature), scattered soiling and creases (heaviest to last page), a tear to the top edge of the last page (passing through a few words in the first three lines), and a small area of paper loss to one corner. 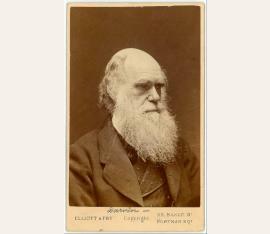 At this time Darwin was preparing his fourth English edition of Origin of Species at the request of his publisher, which was significantly revised from the original and published in November 1866. After first publishing it in 1859, Darwin’s concepts and personal renown had spread worldwide throughout both the scientific and lay communities. His work was hotly debated throughout Germany, and Suchsland wrote to Darwin to suggest that he authorize a renewed translation—the last German version of Origin of Species having been published in 1863—as inaccuracies in the text led some of his theories to be widely misunderstood. 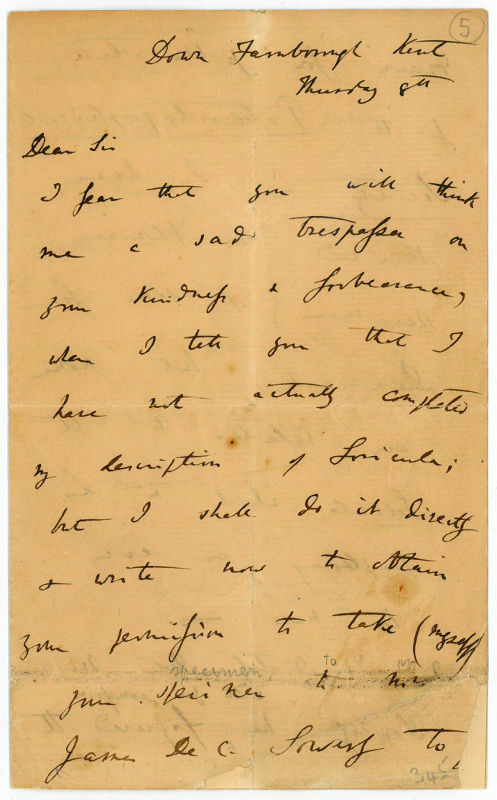 This letter reveals both the diversity of scientific subjects in Darwin’s corpus and his business acumen in discussing the commercial viability of his own work..
English naturalist (1809-1882). Autograph Letter Signed ("Ch. Darwin"). Down, Beckenham, Kent, Railway Station Orpington S.E.R. 8vo. 1 page. On personal stationery watermarked Joynson Superfine, some stains to blank, two small spots to upper section, light thumb-soiling to fore-edge, some small adhesive stains to lower edge. ". To J.F. Galbraith: „I thank you for your kindness in having written me so long a letter, but I can assure you that there is not a naturalist in the world who would credit that germinating seeds could be developed into animals of any kind. There was plenty of time and means for the indefinite multiplication of innumerable kinds of animals in the cask.“ - The recipient, J.F. 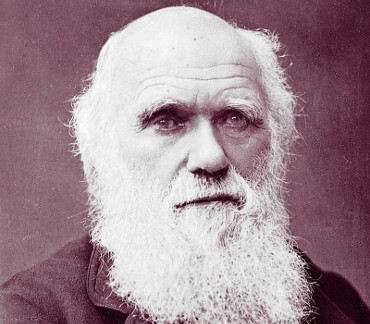 Galbraith of Nelsonville, Manitoba, wrote Darwin a 3-page letter on October 20, 1881 in which he recounts an incident of development of worms in a barrel of wheat, noting that he had pondered Darwin's view that plants and animals may have had a common ancestor. Darwin tactfully sets him straight. 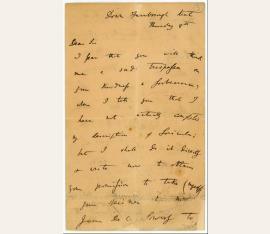 See Darwin Correspondence Database, http://www.darwinproject.ac.uk/entry-13417; Burkhardt, Frederick, A Calendar of Correspondence of Charles Darwin, 1821-1882, Volume 1, p 562..
English naturalist (1809-1882). Autograph letter signed. Down, Beckenham, Kent. 8vo.. 2 pp. Bound before: Krause, Ernst. Erasmus Darwin. Translated from the German by W. S. Dallas. With a preliminary notice by Charles Darwin. Lodon, John Murray, 1879. 8vo. IV, 216 pp. With a portrait frontispiece and a fullpage illustration. Full cal. 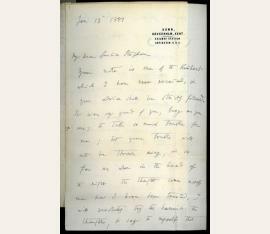 To the writer and critic Sir Leslie Stephen (1832-1904), whose copy this book is, responding to Sir Leslie's reassurances after having been attacked by the novelist Samuel Butler (1835-1902): "My dear Leslie Stephen. 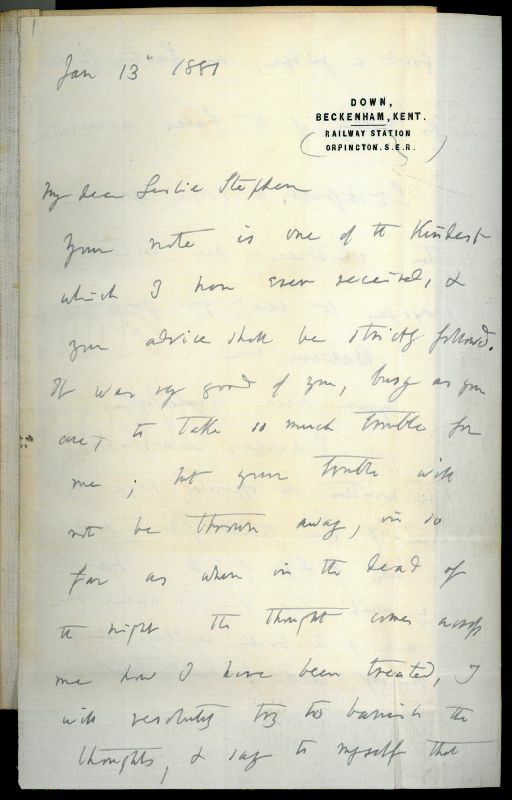 Your note is one of the kindest which I have ever received, & your advice shall be strictly followed. It was very good of you, busy as you are, to take so much trouble for me; but your trouble will not be thrown away, in so far as when in the dead of the night the thought comes across me how I have been treated, I will resolutely try to banish the thoughts, & say to myself that so good a judge as Leslie Stephen thinks nothing of the false accusation. The Litchfields & some of my other children are intensely curious to read your judgment. Believe me / yours ever gratefully / Charles Darwin. / I have written on opposite page my name if you think fit to paste it into the Life of E.D. ; but I much wish that you would name one or more of the books, written wholly by myself, which I could treat in the same manner for you." Indeed, the dedication "From Charles Darwin / with kindest regards / Jan. 13th 1881" has been cut out and mounted on the flyleaf, and underneath Sir Leslie has added by way of explanation: "The letter upon the next page refers to a silly attack made upon Darwin by Butler of 'Erewhon' etc. I had given Darwin the obvious advice to take no more notice of the creature, D. having already made a sufficient acknowledgement of a trifling error. For details see 'Academy' of the period. LS. 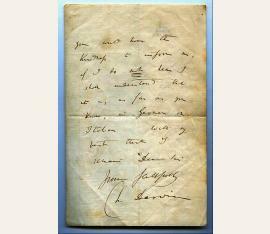 - Darwin afterwards sent me the 'Origin of the Species' & the Voyage of the Beagle." - The physician Erasmus Darwin (1731-1802), Charles's grandfather, espoused an early theory of evolution all his own, which he sketched, obliquely, in a question at the end of a long footnote to his popular poem "The Loves of the Plants" (1789). Samuel Butler rejected Charles Darwin's theory of natural selection. 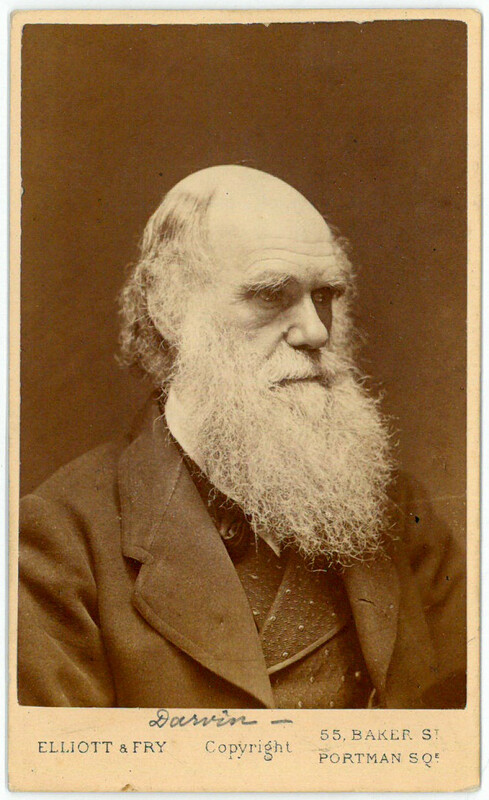 In his 1879 book "Evolution, Old and New" he accused Darwin of having borrowed heavily from and distorted Buffon, Erasmus Darwin and Lamarck, trying to reinstate these earlier thinkers and with them, the design argument. - Provenance: By descent to Leslie Stephen's daughter, the writer Virginia Woolf (1882-1941), who left it to her husband, the writer Leonard Woolf (1880-1969). Woolf had the book auctioned at Sotheby's a year before his death (sale of Feb. 29/20, 1968, lot 279); acquired by a northern Swedish collector, whose descendants returned it to the trade..
English naturalist (1809-1882). 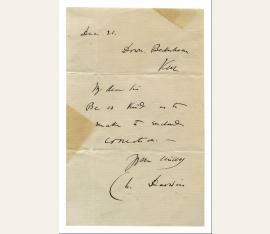 Autograph letter signed ("Ch. Darwin"). Down, Beckenham, Kent. 8vo. 2 pp. on bifolium. 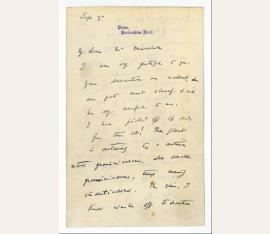 To the British architect William Cecil Marshall (1849-1921), whom Darwin engaged to build an extension to Down House on the north side (a billiard room with dressing room and bedroom above) in 1876, thanking him for some Pinguicula leaves, from which he has picked off sixteen seeds: "My dear Mr Marshall, I am very grateful to you. Your observations are excellent, & are put most clearly & will be very useful to me. I have picked off 16 seeds from this lot! The plant is certainly to a certain extent graninivorous also somewhat graminivorous, though mainly insectivorous. The rain, I know washes off the secretion & with it captured insects (& as you say seeds), which are retained by the incurved edges, which then become more incurved. It is a pretty experiment to put a row of flies or cabbage seeds on one margin of a flat leaf & see how the edge of the side curls over in from 12 to 24 hours. With cordial thanks, Yours very sincerely [...]". - Traces of folds; professionally repaired. 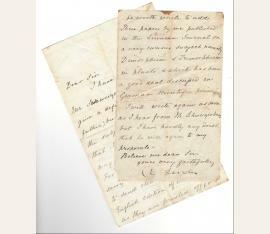 On stationery with printed address..
English naturalist (1809-1882). Autograph letter signed. Down, Beckenham, Kent. 8vo. 3 pp on bifolium. On Darwin's embossed letterhead (Down, Bromley, Kent, S.E.) with "Bromley" crossed out and changed to "Beckenham" in Darwin's hand. 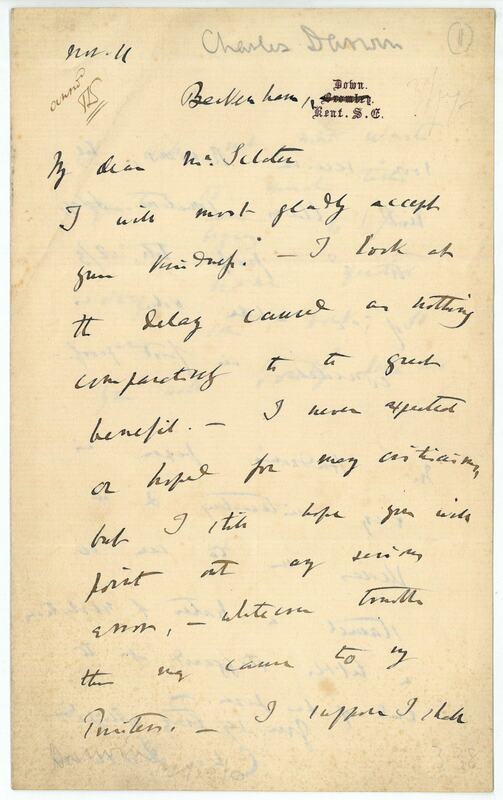 To Philip Lutley Sclater, who has been reading the proofs of Darwin's "Descent of Man", describing the ornithologist William Henry Hudson (1841-1922) as "a hater of evolution": "I will most gladly accept your kindness. I look at the delay caused as nothing comparatively to the great benefit. I never expected or hoped for many criticisms, but I still hope you will point out any serious error, whatever trouble this may cause to my Printers. I suppose I shall soon receive Revises, but Messrs Clowes [the printers of The Descent of Man] sometimes delay the 2d proofs till 23 of a whole vol. is corrected in first proof. - Mr Hudson's paper is very interesting & it pleases me to see so staunch a hater of evolution a little staggered at the end of his paper [...] I will not now waste quite so much time in trying to find every name quoted in some book; so you will doubly help me". - One of the earliest known examples of the use of the term "evolution" in the Darwinian sense, pre-dating its first appearance in print in "The Descent of Man". Although the term had long been in use in embryology, having been introduced with a specific meaning in 1762 by Charles Bonnet in his "Considerations sur les corps organisées", its use had been avoided by Jean-Baptiste Lamarck in his 1809 work, "Philosophie Zoologique"; likewise, Darwin long resisted its use in the field of ontogenesis (biological development), preferring instead the phrase "descent with modification". 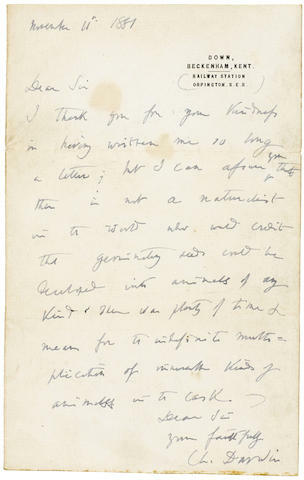 In the last sentence of the first edition of "Origin" (1859), Darwin did use the verb "evolved" ("From so simple a beginning endless forms most beautiful and most wonderful have been, and are being, evolved"), but he had still not yet settled on the term "evolution" to articulate his most important theory. In 1862, three years after the publication of "Origin", Herbert Spencer provided his own ontogenetic definition of the term in "First Principles": "Evolution is a change from an indefinite, incoherent homogeneity, to a definite, coherent heterogeneity; through continuous differentiations and integrations." This definition failed to grasp a principle that Darwin had already recognised - that of adaptive complexity, or the idea that natural selection will tend to favour the evolution of new, specialised varieties. It was this feature that distinguished Darwin's theory from that of Lamarck, as well as from those of Spencer and other contemporaries, and which would become the central organizing principle that biologists use to understand the world. - The word "evolution" occurs for the first time in any of Darwin's printed works in "The Descent of Man" (vol. 1, p. 2), first published on 24 February 1871; Darwin then uses it - as a noun - in the revised 6th edition of "Origin" (published on 19 February 1872). - Original folds, a few toning spots, otherwise fine. Provenance: collection of Sir Edward Ford (1902-86), distinguished physician and philanthropist, Sydney; believed to have been acquired by Ford in London in the 1960s, from either Maggs Bros. or Winifred Myers. 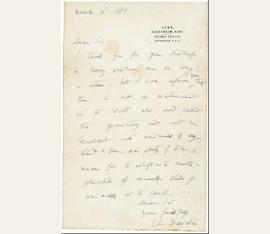 Accompanying this Darwin letter is a photocopy of a handwritten letter addressed to Sir Edward Ford from Dr. David Kohn, associate editor of The Collected Letters of Charles Darwin (later the Darwin Correspondence Project), dated 30 January 1978 and asking for copies of the Darwin letters in his collection and his permission for them to be published..
English naturalist (1809-1882). Autograph letter signed. Down Farnborough Kent. 8vo. 4 pp. on bifolium. 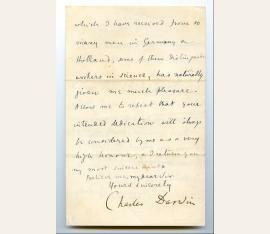 An important letter which underscores Darwin's belief in the scientific significance of the study of Cirripedia (barnacles). To Nathaniel Thomas Wetherell: "I fear that you will think me a sad trespasser on your kindness & forbearance, when I tell you that I have not actually completed my description of Loricula; but I shall do it directly & write now to obtain your permission to take (myself) your specimen to Mr. James De C. Sowerby to [be] drawn for publication by the Palæontographical Society.- I have received Mr [John Wickham] Flower's specimens, & some from Denmark but none are related to the Loricula, which is as perplexing as ever to me.- Immediately that Mr Sowerby has with your permission figured the Loricula (& I shall take it up in a fortnight) it shall be returned to you. - Is there any safe place where I could leave it in London for you, or shall I return it by a messenger? - I believe I did once before ask you, whether you have any other fossil Cirripedia. - To save you the trouble of answering, I will assume, without I hear to the contrary that Mr Sowerby may figure it. - With my best thanks | I remain dear Sir | Yours faithfully | C. Darwin | I assure you that it has not been idleness which has delayed me, but numbers of specimens of other fossil Cirri[pe]des". - We are able to date this letter precisely because August 1850 was the only month with a 'Thursday 8th' in the period between the Palaeontographical Society's decision to publish Fossil Cirripedia and the publication of the first volume of this work in 1851, in which Loricula pulchella is described (Fossil Cirripedia (1851): 81-6). - James de Carle Sowerby drew all the figures of the specimens in the first volume of Fossil Cirripedia. At the time of writing, Darwin does not seem to have known that George Brettingham Sowerby Jr had described and figured this particular specimen in 1843. However, since that time Wetherell had cleared away more material from the specimen, revealing features not seen by G.B. Sowerby Jr, and a new drawing was made for Darwin's description (Fossil Cirripedia (1851): 81). (Darwin Correspondence Project). 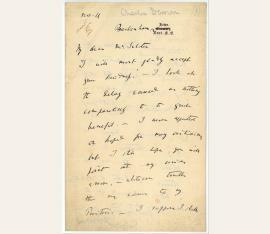 - Published by the Darwin Correspondence Project, University of Cambridge, as Letter no. DCP-LETT-1267. - Slight damage to paper (no loss to text) and in some parts professionally restored..
English naturalist (1809-1882). Original cabinet portrait. [London. 90:59 mm. A fine portrait from the studio of Elliott & Fry, London. Charles Darwin (1809–1882), naturalist. LS. Beckenham, 11 February 1873. 1 p. on double leaf. 8°. With autogr. address on envelope. 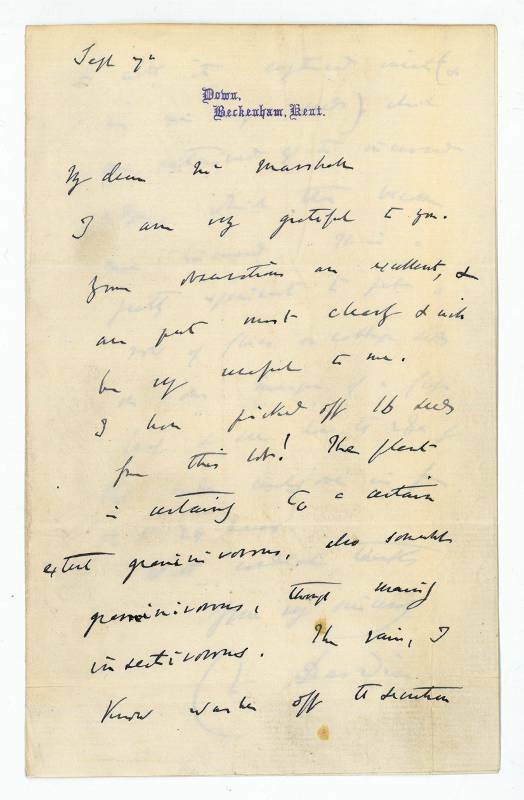 – In English, to the Swiss zoologist and palaeontologist Charles Forsyth Major (1843–1923): “I am very much obliged for your note, & am very sorry that you have had so much trouble & have given up the intention of bringing out a translation. 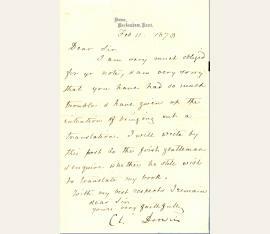 I will write by this post to the Jewish gentleman & enquire whether he still wishes to translate my book [...]”. – Probably in connection with the endeavors of various translators and publishers to profit from Darwin’s growing fame. For “The Expression of the Emotions in Man and Animals”, two writers and translators and expressed an interest, one of them Forsyth Major (cf. Junker, Darwins deutsche Verleger und Übersetzer, p. 270). 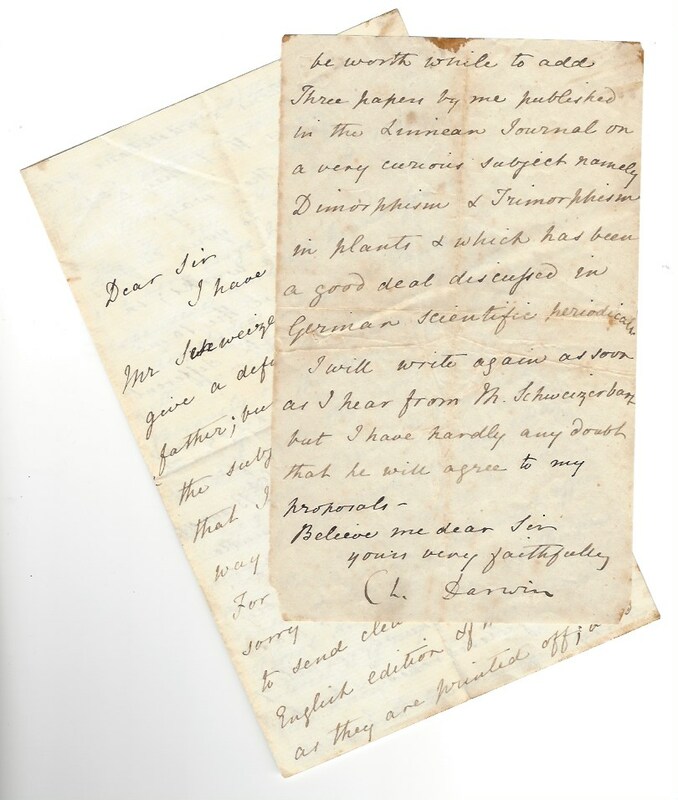 Darwin had already decided on Julius Viktor Carus as a translator and Wilhelm Emanuel Schweizerbart as publisher, but used these letters of enquiry to negotiate higher royalties from the publisher. 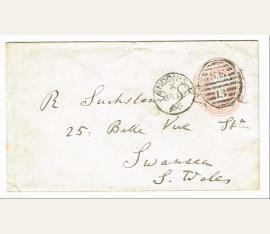 – On stationery with embossed address; stamp cut from envelope. Charles Darwin (1809–1882), Naturforscher. Brief mit e. U. Down, Beckenham, Kent, 30. April 1877. 4 SS. auf Doppelblatt. Gr.-8°. – An einen Kollegen in Deutschland, der ihn gebeten hatte, ihm seine Forschungen zur Anatomie bestimmter Würmer widmen zu dürfen: „[...] I shall consider your dedication as a high & most gratifying honour. Your observation on the dorsal eyes of Onchidium are interesting and surprising in the highest degree. That the same animal should be provided with eyes of two widely different types is remarkable enough; but that you should have discovered gradations in the scale of their development on the same individual is most wonderful & shows us probably by what steps they were developed. On two occasions I have found gradations on the same individual but in structures of comparatively small importance, namely in the tendrils of the vine & and in the ocelli on the feathers of the argus pleasant. Even theses cases interested me much though they are quite trifling compared with your case. There is much truth in what you say about photographs in comparison with published memoirs or books; but the generous sympathy which I have received from so many men in Germany & Holland, some of them distinguished workers in science, has naturally given me much pleasure [...]“. – Die „tendrils of the vine“ hatte Darwin 1875 in „Climbing Plants“ behandelt. – Auf Briefpapier mit gepr. Adresse. Charles Darwin (1809–1882), Naturforscher. E. Brief mit U. („Ch. Darwin“). Down House (Kent), 21. April . 3 SS. auf Doppelblatt. Gr.-8°. – An Rudolf Suchsland, den Sohn des Verlegers Friedrich Emil Suchsland, über eine Ausgabe von Terenzio Graf Mamiani della Roveres „Cofessioni di un Metafisico“, die er lesen könne, „if it were in French [...] but German is too hard work for me without confusion“. – Auf Briefpapier mit gepr. Adresse; etwas knittrig und fleckig. Probably to a printer or publisher: "My dear Sir, Be so kind as to make the enclosed correction [...]". - Two brownstains near top and left edges. Traces of folds. Without the list of corrections mentioned. 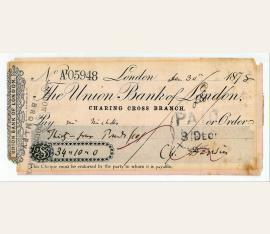 Cheque signed ("Ch. Darwin"), made out to "Mr Nicholls".